"Stormwater Runoff Reduction on the Worcester Polytechnic Institute Cam" by Benjamin James Secino, Blayne Patrick Merchant et al. Stormwater from Worcester Polytechnic Institute (WPI) drains directly into nearby Salisbury Pond, contributing to its chronic pollution. For our project, we worked with WPI Facilities to develop a plan to more effectively manage stormwater runoff in one area of campus. We assessed WPIs current stormwater management practices, investigated existing solutions, and detailed which solution was most feasible for WPI. 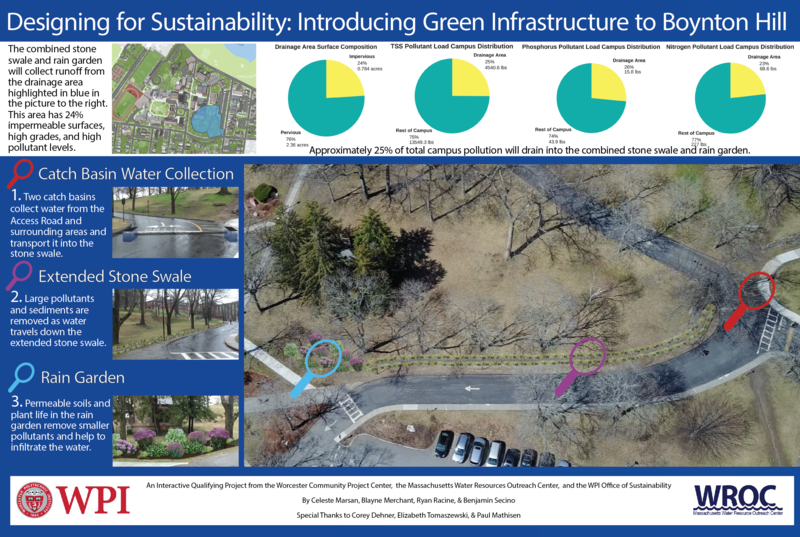 We found that a combined stone swale and rain garden would best serve our campus needs by reducing or eliminating frequent flooding in the center of campus and simultaneously reducing the quantity of stormwater entering Salisbury Pond through storm sewers. In collaboration with WPIs Office of Sustainability, we submitted our proposal to the US EPAs RainWorks Challenge.